Martin ready to Rumble. 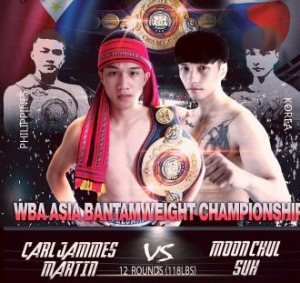 World-ranked Filipino Carl Jammes Martin (10-0, 9 KO's) is set to make the first defense of his WBA Asia Bantamweight Belt against hard-hitting Korean challenger Moon Chul Suh of Iksan City at LCS Gym in Lagawe, Ifugao Province, a battle too important for the promising, hard-hitting Ilocano "Wonder Boy." Martin, 19, the pride of the Ifugao Boxing Stable, climbs back to the square ring after stopping in six chapters Chinese Huerban Qiatehe last August, a win that made him the new WBO Oriental Youth champion. Now, the unbeaten Ifugao striker wants more scalping and Moon Chul Suh is the next target on sight. But Moon Chul Suh - a former WBF Asia-Pacific 122-pound champion, who has knocked out his last three opponents - has plans of his own. Moon is coming to the Philippines like a hungry tiger hunting for a prey. Indeed, the tough Korean not only wants to victimize Carl Martin and damage unbeaten record. He also wants to grab away Martin's precious shinning WBA Asia Champion belt, and rob of his WBO world-ranking. Yes, Martin is putting a lot on the line of fire. 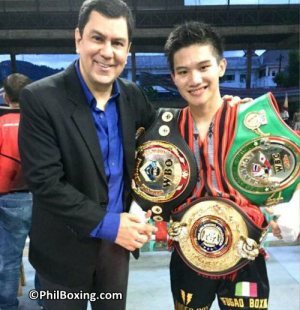 "I CAN SEE THE FIGHTING SPIRIT IN HIS EYES"
Will "The Wonder Boy" Carl Martin scalp Moon Chul Suh for a successful WBA Asia title defense to press forward his boxing career while climbing-up in the world-rankings..?? Or will the hard-puncher Korean outclass Martin, taking everything from him..?? "I know this fight against the Korean boxer will not be easy," shares Abel Martin. "That is why Carl has been doing hard training. Because this match from Korea is a dangerous knock out artist. "Carl has been training at our Ifugao Boxing Stable. During the past weeks, he has focused on power punch and speed. "In addition to that, Carl has kept on learning new boxing techniques at our gym. "Above all, there is something really good about Carl, which is that he is fully dedicated to his profession as a boxer, and he always adds extra in training. "Carl always insists on extra time at the gym. "I can see the fighting spirit in his eyes." Exciting young professional boxers from the area will see action in the preliminary bouts of the much awaited October 27 card at Lagawe, Ifugao. Fighters set to see action include John Magagmoc, Roy Nagulman, Evander Dogwe, Eufemio Gamangan, Jessie Roger Tuguinay and more. Plus, five action-packed amateur bouts are scheduled to thrill fans in attendance. "Bangon Cordillera The Fight Continues" Saturday October 27 at Lagawe's LCS Gym is another production of Ret, Philippine Army General Ramon C. Yogyog in association with Ifugao Boxing Promotions. Matchmaker is man of boxing Salvador "Saldy" Lopez of Santa Rosa, Laguna. Fights Start at 1 PM. Filipino 118-pounder Carl James Martin shows his collection of title belts. His WBA Asia belt will be on the line October 27.